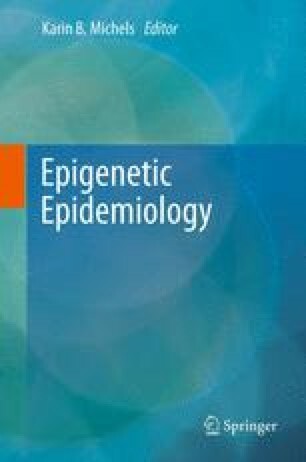 Knowledge and inclusion of epigenetic variants as potential risk factors for obesity and type 2 diabetes (T2D) will improve diagnosis and mechanistic understanding of these complex metabolic disorders. A number of practical and conceptual issues still have to be worked out before epidemiological studies can fully integrate epigenomic approaches. Altered patterns of histone modifications, DNA methylation, and microRNA levels are implicated in obesity and T2D. Recent studies are discussed, thereby illustrating strengths and challenges to accurately identify and measure epigenetic differences that covary with metabolic disorders. Unlike classical, DNA sequence-based approaches, the choice of cell or tissue type as source material may confound the results of such epigenomic studies. It is becoming clear that various types of epigenetic signatures exist; some are very stable and do not change over many years within an individual, whereas others are liable to change and perhaps more influenced by age and environmental and physiological conditions. A standardized classification system to accurately describe and characterize the properties of newly identified epigenetic signatures will enable the generation of reproducible epigenetic data. I am grateful to the editor, Karin Michels, as well as Catherine Suter and David Martin for comments and suggestions on the manuscript.